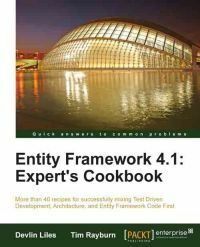 Entity Framework 4.1: Expert's Cookbook by Devlin Liles and Tim Rayburn is one of the few Entity Framework books already covering the 4.1 features: DbContext and code first approach to development. Its cover and table of contents promise a lot and in my opinion they also deliver most of it. I like the fact that it doesn't just cover the basics but dives deeper instead, describing more advanced patterns and demonstrating how to solve some of the problems in real world projects. It is structured as a collection of stand alone samples for different scenarios. In particular it is easy to look up just the parts of it when you need them, each one being accompanied by a working downloadable piece of code. On the other hand individual samples in this book do build on one another therefore it's a good idea to first read the book from beginning to end. This makes it much easier to follow the later chapters. Some of them include lots of code which can be difficult to grasp, even more so because it's not clearly visible which parts of the code are really relevant to the particular recipe. I strongly discourage skipping the first two chapters which really form the basis for all the rest. I can certainly recommend the book as a useful resource for anyone working with the latest versions of Entity Framework. It is not a book to start learning Entity Framework with, though. Some previous knowledge and experience is definitely recommended to make the most of it. It might also encourage you to find out more about the concepts and patterns it briefly describes at the end of each recipe. They are more of a starting point than a final destination. The book is available on Amazon as well as sold directly by the publisher.